This book was just as amazing as the first one. Wow wow wow. 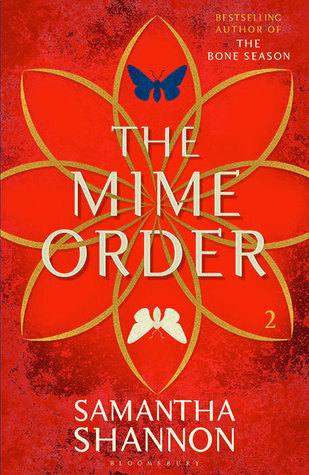 The Mime Order follows Paige and her little entourage in the hopes of solving all the issues with the Rephiam and the Syndicate and SciLondon. She decides to enroll into the battle to become Mime-lord with Jaxon. The two are the dream team. Mime-lord and mollisher of I-4. Oh my gosh. So no spoilers, but the ending was everything I wanted in life it was so fricking good. If you want an epic fantasy/sci-fi series, read The Bone Season, then read this because it’s amazing. Samantha Shannon has a way of writing that just draws you in so much, and keeps you hooked until the last sentence. Literally the last sentence of this book omg. So much happened in this book, and the only reason it took me so long to read was because I was buddy-reading this and my buddy didn’t read as fast as me. So I’ve had to take breaks while reading, but it was still so good. If this wasn’t part of a buddy-read I would have easily finished it in a couple of days because I was hooked. WARDEN IS BACK. Yay!! He’s my favorite character, I think, because he’s so mysterious. He’s just trying to do the best for everyone around him, and his feelings for Paige… I don’t know exactly how he feels yet, but I have a feeling the next book will let me know. I’m so excited to read the next book because I know it will answer so many questions! I cannot wait to see what happens with the rest of the series. I have no idea at all where it’s going to go because I don’t even know what’s going to happen in the next book! I know Samantha Shannon will take it great places because her writing style is gorgeous. Please read this series. It’s so well written, and there’s so much action. Seriously so much action the whole entire time. Paige is always getting into something, and she somehow always figures out how to get out of it. I can’t wait for the rest of this series! !